Where is the connector located that the backup lamp pigtail plugs into? The backup lamp pigtail? There is no "lamp pigtail". The backup light equipped '65 and '66 Corvettes have a different rear harness with wiring for backup lights that go out of the main harness and directly into the lamp socket. Now, if you mean the pigtail for the switch, this connector is located out of the main harness under the hood - at the firewall. I did mean the backup lamp switch pigtail. Sorry about the confusion and thanks for the answer. I've purchased the trans switch to the backup plug at the firewall but not working. Have power at the black wire and jumped the power to the lt green wire and still no lights. 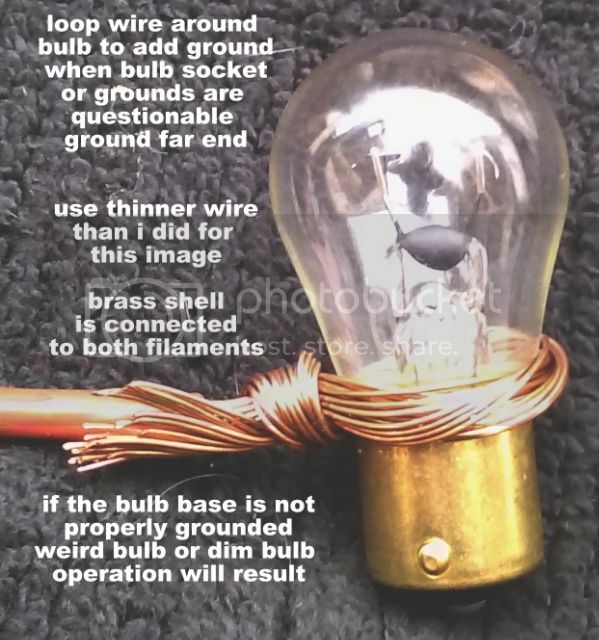 Other than the bulbs where do I look first? check for ground at the other end..
drop a set of jumper cables on the floor under the car.. hooked up on one end to the negative battery cable..
now you can run a short jumper wire to the neck of the bulb to see if that is the issue..
electrons flow from negative to positive.. no negative.. no electrons.. no bulb operation..
you can... use a digital volt meter from the jumper cable to the bulb shell or the housing..
if you get more than 0.04 volt.. you probably have a bad ground..